The name “Athlumney” derives from “Atha Luman” or “Loman’s Fort”. 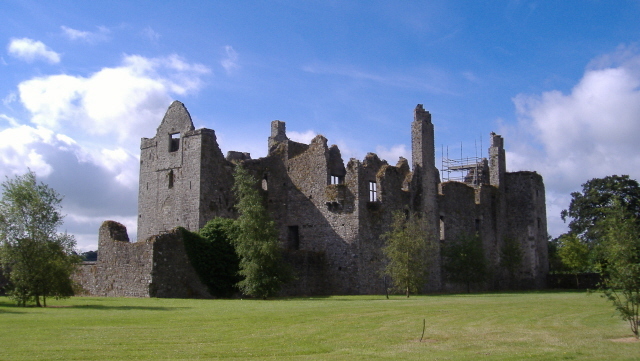 St. Loman was the first Bishop of Meath and is reputed to have been a nephew of St Patrick. There are at least three building phases in this castle. The earliest part is the Tower House which was built in the 15th century. This was the home of a wealthy late medieval landowner who built the tower for security but also as a status symbol. It has four storeys, at second storey level there is a small concealed chamber reached only by descending a flight of steps. The second phase of the building was when a long, vaulted room (now in ruins) was added to the tower to provide more comfortable accommodation. At the start of the 17th century, during a third building phase, a fine mansion (Manor House) with gabled roof was attached to the tower. This has windows with stone bars, several fireplaces and an oriel window (projecting bay window). That house was still quite new when the Maguires, who were in possession of it, set it alight rather than allow Oliver Cromwell’s army to capture it. The last Lord of Athlumney was Sir Lancelot Dowdall. He supported King James 2nd in the war against William of Orange. When King James was defeated at the Battle of the Boyne (1st July 1690) Sir Lancelot set fire to the castle rather than see it taken by King William’s army and he fled in exile to France. The property later belonged to the Sommerville family of Kentstown. When the estate was broken up the land around the Castle was bought by Bishop Nulty for the Sisters of Mercy. He planned to build a seminary there but when he died his successor built a seminary in Mullingar. Pat & Pauline Boylan have been appointed by the Irish Government as Caretakers of Athlumney Castle and have been entrusted with a key to the Castle. You can enjoy a private tour of the Castle while staying at Athlumney Manor B&B.